Thank you to everyone who attended this reception at the Lunenburg Yacht Club. MICA director John Meisner presented a brief update on the status of the current Backmans and Covey Islands campaign and introduced the evening's speaker. Many thanks to our guest speaker, David Corkum, for sharing his insights on and passion for Mahone Bay and its islands. David gave a very informative presentation on the geological, historical and ecological significance of the Mahone Bay islands and why they should be protected as they are like "delicate flowers". This was followed with Mary Knickle singing a beautiful rendition of "Hills and Glens" to a backdrop of photographs of the islands and shorelines of Mahone Bay. The evening was capped off with another wonderful performance by Midlife Crisis with their selection of truly appropriate music. 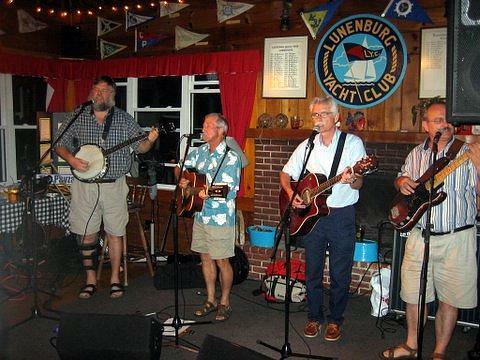 Thanks also go to our host, the Lunenburg Yacht Club, for their great facilities and service. MICA welcomes new members who signed up and appreciates the generosity of those who donated and made pledges to our current project. It was inspiring to have such a good turnout on this summer evening. We enjoyed visiting with all of you and look forward to seeing you at future MICA events!